Editor's note: Earlier versions of this story, citing a plaintiffs' lawsuit and press release, mentioned a "MyMercury Touch" System. A Ford spokesman said today that such a system never existed because the Mercury brand ceased to exist before the infotainment system was launched. 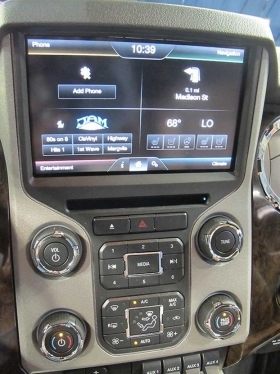 A proposed class-action lawsuit was filed against Ford Motor Co., alleging that the MyFord Touch and MyLincoln Touch infotainment systems are defective. In a 41-page compliant filed Monday in the U.S. District Court for the Central District of California, the Center for Defensive Driving alleges that the system -- which was tested in a 2013 F-150 Lariat pickup leased by the organization -- often freezes, fails to respond to voice and touch commands and has a poor connection with mobile phones and MP3 players. The CDD offers free educational presentations on defensive driving to the public, according to its Web site. The organization's three directors are volunteers; it has no paid staff. The complaint alleges that Ford knew about the defects but did not disclose the problems to potential customers. Ford has issued several technical service bulletins regarding system errors, and the company upgraded and extended the warranty on the system following complaints last year. In 2011, Ford CEO Alan Mulally acknowledged problems with the system, but said that customers would be satisfied after the upgrade that was released last year. In November 2012, Ford reported that there were 400 problems with the MyFord Touch system for every 1,000 vehicles, according to Reuters. The company has pledged to resolve at least 40 of those problems by August, the report said. A Ford spokesman said the automaker does not comment on pending litigation. The suit cites several NHTSA complaints regarding the defect and also points out that David Sargent, vice president of global vehicle research at J.D. Power and Associates, told The New York Times that the infotainment system was a primary reason for Ford's decline in the firm's rankings. Although the suit claims that the faulty system represents a safety risk, the main aim of the suit is to seek damages related to the inconvenience of the product defects, Jason Zwieg, an attorney for Hagens Berman Sobol Shapiro LLP, said. The firm is representing the CDD. Zwieg said the monetary value of damages alleged in the suit will be determined during the discovery phase. He said interest in the suit has been high, but declined to comment on additional plaintiffs. CDD President Chris Knox said the defective systems present a safety issue because they force drivers to use their mobile device manually instead of using voice commands. He said Ford should discontinue the MyFordTouch system instead of trying to improve it. "Ford needs to scrap it, not update it," Knox said in an interview. Ironically, the CDD claims on its Web site that the Ford Motor Company Fund, a charitable arm of the automaker, is a founding sponsor. A spokeswoman for the chartable fund confirmed that it had issued a grant to the CDD.